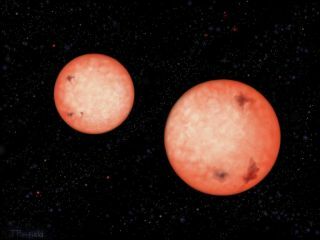 This artist's impression shows two active stars — M4-type red dwarfs — that orbit each other every 2.5 hours, as they continue to spiral inwards. Eventually they will coalesce into a single star. Four pairs of what astronomers are calling "impossible stars" — stellar twins in orbits so close they defy explanation — have been found in our Milky Way galaxy, scientists say. Astronomers using the United Kingdom Infrared Telescope (UKIRT) in Hawaii discovered the four star pairs, each of which is a binary system in which two stars circle each other in less than four hours. Until now, scientists thought that such twin-star setups couldn't exist. It was typically thought that if a star formed too close to another, the two stars would quickly merge into a single, bigger star. This theory seemed to agree with observations taken over the last three decades, which reveal that binary systems are abundant, but none of the pairs have an orbital period shorter than five hours, the researchers said. The astronomers focused on binaries of red dwarfs, which are stars that are up to ten times smaller and a thousand times dimmer than the sun. While red dwarfs are the most common type of star in the Milky Way galaxy, they often do not show up in astronomical surveys because they are too dim in visible light. "To our complete surprise, we found several red dwarf binaries with orbital periods significantly shorter than the 5 hour cut-off found for sun-like stars, something previously thought to be impossible," the study's lead author Bas Nefs, from Leiden Observatory in the Netherlands, said in a statement. "It means that we have to rethink how these close-in binaries form and evolve." Early in their lifetimes, stars shrink in size, which suggests that the orbits of stars in these tight binary systems must have also shrunk since they were formed, the researchers said. If not, the stars would have interacted with each other early on, and would have likely merged. But, how the orbits of stars in these binaries shrunk by so much remains a mystery. According to the new study, one possible explanation is that cool stars in binary systems are much more active and violent than was previously thought. As the cool stellar companions spiral in toward each other, their magnetic field lines may become twisted and deformed. This powerful magnetic activity may help slow down the spinning stars, allowing them to move closer together, the researchers explained. "The active nature of these stars and their apparently powerful magnetic fields has profound implications for the environments around red dwarfs throughout our galaxy," study co-author David Pinfield, from the University of Hertfordshire in England, said in a statement. Detailed results of the new study appear in the journal Monthly Notices of the Royal Astronomical Society.